At this point, is anyone besides those either deep in Tolkien lore or who have seen the other five films interested in Peter Jackson's last journey through Middle-Earth? It is hard to tell as even the trailer for the final chapter in The Hobbit trilogy feels somewhat exhausted. The newly minted Battle of the Five Armies will surely run almost three hours and feature plenty of giant battle sequences, but the whole thing just feels rather tired at this point. I was never a huge fan of The Lord of the Rings trilogy though I certainly found appreciation in each of the films and while I feel like I'm in the minority who enjoyed An Unexpected Journey more than The Desolation of Smaug I don't know that I'm exactly looking forward to what the final installment has to offer. They are visual wonders, to be sure, but I certainly feel the overwhelming sense of CGI and extension of the story has turned this second trilogy into more of a financial than artistic endeavor. Don't get me wrong, I hope Jackson has something up his sleeve and proves my pessimism wrong, but if the trailer is any indication they may go out with more of a whisper than a bang. 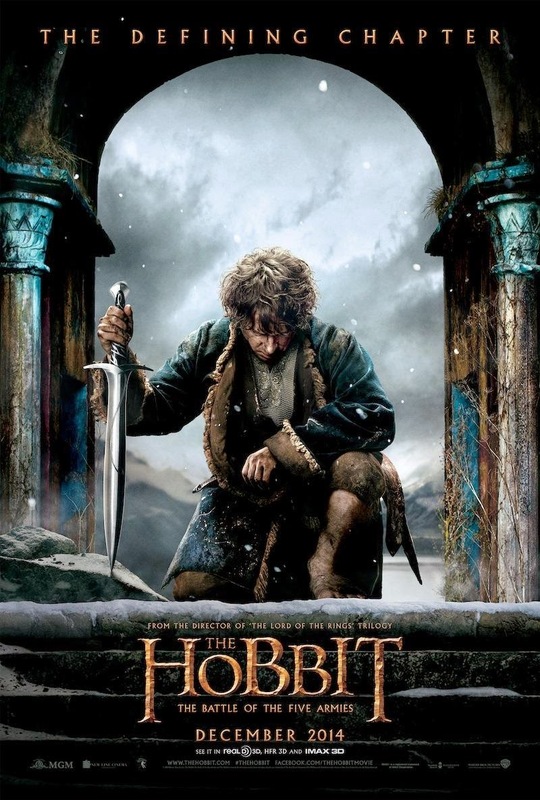 The first full-length trailer for the film is the same that premiered at Comic-Con over the weekend and is slow-paced, again featuring “The Steward of Gondor”, which was also used in The Return of the King. The film is being touted as the defining chapter of the Middle-Earth saga and so we will have to wait and see if the final product lives up to this claim or if the marketing simply hopes to cash in on the finale. The Hobbit: The Battle of the Five Armies stars Ian McKellen, Martin Freeman, Richard Armitage, Evangeline Lilly, Lee Pace, Luke Evans, Benedict Cumberbatch, Stephen Fry, Cate Blanchett, Ian Holm, Christopher Lee, Hugo Weaving, Ken Stott, James Nesbitt, Orlando Bloom and opens in theaters on December 17th. Synopsis: “The Hobbit: The Battle of the Five Armies” brings to an epic conclusion the adventures of Bilbo Baggins, Thorin Oakenshield and the Company of Dwarves. Having reclaimed their homeland from the Dragon Smaug, the Company has unwittingly unleashed a deadly force into the world. Enraged, Smaug rains his fiery wrath down upon the defenseless men, women and children of Lake-town. Obsessed above all else with his reclaimed treasure, Thorin sacrifices friendship and honor to hoard it as Bilbo’s frantic attempts to make him see reason drive the Hobbit towards a desperate and dangerous choice. But there are even greater dangers ahead. Unseen by any but the Wizard Gandalf, the great enemy Sauron has sent forth legions of Orcs in a stealth attack upon the Lonely Mountain. As darkness converges on their escalating conflict, the races of Dwarves, Elves and Men must decide – unite or be destroyed. Bilbo finds himself fighting for his life and the lives of his friends in the epic Battle of the Five Armies, as the future of Middle-earth hangs in the balance.